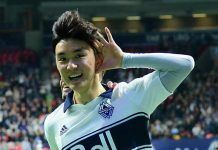 VANCOUVER, BC – Vancouver Whitecaps FC (5W-6L-1D) had their three-match MLS home winning streak snapped on Saturday evening as they fell 1-0 to D.C. United (4W-6L-2D) at BC Place. Following Tuesday’s Canadian Championship 2-1 semifinal win against Montreal Impact, where coach Carl Robinson opted for a 3-4-2-1 formation and a completely changed starting lineup, the ‘Caps decided to return to their more regularly featured 4-1-4-1 set-up. With holding midfielder Matias Laba suspended for the match (yellow card accumulation), Alphonso Davies came into the lineup at left wing, with Christian Bolaños moving centrally and Andrew Jacobson dropping deeper into Laba’s regular position. The ‘Caps started off the match with pace, taking the play to D.C. United. 16-year-old Davies burst forward early into the opposition half, slipping past Luciano Acosta before sending a left-footed cross across Bill Hamid’s box that evaded his teammates but signaled an attacking intent from the home side. At the other end of the pitch, ‘Caps keeper David Ousted really got the crowd going at BC Place when he stretched out his entire 6-foot-4 frame to make a diving fingertip save on a powerful left-footed strike by Acosta to keep the score at 0-0. Robinson’s men continued to have a bevy of chances in the opposition half. Striker Fredy Montero managed to find some space for himself and sent in a cross that was met well by the forehead of Cristian Techera, only to be thwarted by the crossbar. United’s woodwork saved the day again only moments later when midfielder Tony Tchani headed a ball into the D.C. box from a deflected play. Captain Kendall Waston met the ball with a quick overhead kick that had everyone beat except the crossbar, once again. Bolaños continued the ‘Caps foray into DC’s half with an ambitious solo effort, taking the ball from midfield and dribbling through several black shirts before attempting a strike on goal that was deflected for a corner kick. Moments later, centre back Tim Parker came agonizingly close to break the deadlock. The powerful defender rose high to meet Bolaños’ corner kick and connected with the ball almost perfectly, but a quick Hamid was up to the challenge, making the goal-line save. But the ‘Caps would not relent. D.C. defender Steve Birnbaum managed to halt a Techera cross in the 44th minute as the deflection fumbled to a wide-open Montero who saw his point-blank shot stopped by Hamid again. Vancouver approached the second half with the same mindset. Scoring chances continued to present themselves with Andrew Jacobson coming close in the 55th minute when his volley from outside the box flew on the wrong side of the post. But in the 59th minute, those missed chances came back to haunt the ‘Caps. In one of DC’s rare attacking runs, José Guillermo Ortiz found himself in the ‘Caps and tumbled easily to the ground, with an apparent foul called by referee Sorin Stoica who pointed to the spot to award the penalty kick. Earlier this week, Ortiz was fined by the MLS Disciplinary Committee for simulation and embellishment in their last match versus Chicago Fire. Lamar Neagle stepped up and made no mistake, clinically placing the shot in the top right-hand corner, beyond the reach of Ousted. Having out-chanced the opposition and being one goal down nonetheless, coach Robinson brought on Brek Shea into the game in the 63rd minute, replacing Davies. 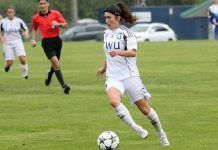 Despite the 1-0 deficit, Vancouver continued to probe for an equalizer. Parker tested Hamid with a powerful strike from outside the box in the 62nd minute, then Montero tried to squeeze in a shot with the outside of the boot late in the game. But DC’s keeper was up to the task each time, parrying Parker’s strike and deflecting the Montero attempt along with the follow-up rebound. In the eleventh hour, Vancouver would get one last opportunity. In added time, Bolaños would find a towering Shea inside the box. The U.S. international managed to connect with the ball with a strong header, only to see it ping off the crossbar once more. Shea paid the price for the gutsy play, colliding head on with the outstretched palms of a challenging Hamid and remained on the ground for several minutes. But in a late turn of events, referee Stoica pointed to the spot, awarding the ‘Caps a lifeline to salvage a point. Techera stepped up for the kick but would be unable to convert the opportunity, his strike smacking the inside of the left post and careening away from danger towards the far-right corner flag. That would be the last kick of the can for the ‘Caps as the referee blew the final whistle moments later and their home winning streak came to an end. Whitecaps FC now head out for an east-coast road trip to play Montreal Impact at Stade Saputo this coming Tuesday, May 30, 2017 for the return leg of the Canadian Championship semifinals. The ‘Caps will be looking to eliminate the Impact, whom they lead 2-1 on aggregate, and advance to play for the Voyageurs Cup. Kickoff is at 4:30 p.m. PT. The ‘Caps then continue their MLS home-stand on Saturday, June 3 as they return to BC Place to host Atlanta United, one of two new clubs to join the MLS circuit this year.